Hellenic Antidote: Et tu, Brute? 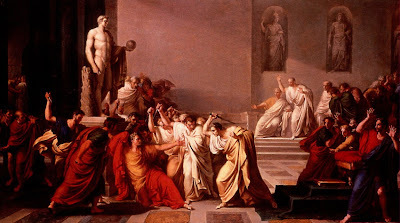 Regarding my post yesterday on the Ides of March and the assassination of Julius Caesar, it’s been pointed out to me that ‘Et tu, Brute?’ is best translated as ‘Even you, Brutus?’ and not ‘And you, Brutus?’ I agree with this. It better conveys Julius Caesar’s sense of betrayal and bewilderment. Someone else disputed the account of Caesar’s death given by Suetonius – which has it that after being stabbed by Brutus, Julius Caesar declares to him, in Greek, ‘Kai su, teknon?’ (You too, my child?) – on the grounds that Julius Caesar knew no Greek. But, of course, Julius Caesar knew Greek, as any educated Roman aristocrat of the time would have known Greek. Greek culture and learning, in fact, dominated Rome and was the cornerstone of patrician education and intellectual standing. (Horace: ‘Captive Greece took captive her savage conqueror and brought the arts to rustic Rome’). Julius Caesar also spent a great deal of his career in the Greek-speaking east, in Bithynia, Cilicia, Caria, Rhodes – where Caesar studied with the leading rhetorician of the day, Apollonius Molon – and Alexandria, where he notoriously became infatuated with the Greek queen of Egypt, Cleopatra. ‘You too, my child, will have a taste of power’ is in fact a more complex and compelling statement than either Suetonius or Shakespeare and suggests denunciation as well as pity and shock in Caesar’s final words, horror that his trusted friend Brutus is among the assassins but also irony, sarcasm and contempt as he bitterly reproaches Brutus, predicts (correctly) his violent demise and reveals him not as ‘the noblest Roman of them all’, but as a power-hungry hypocrite, as ambitious and envious as the other assassins.